If you’re looking for a nutritious beverage that is good for your health and tastes delicious then this sea moss drink has it going on. When it comes to adding the right spice blends to a tropical drink, the Caribbean are good at mastering that fine balance. If you want to learn how to make sea moss drink that is vegan, modified yet still packed with flavour then read ahead. Sea moss is a type of algae which grows on the rocky parts the Atlantic coast and North America. It is referred to by several names including Irish moss, Chondrus Crispus and Carrageen moss. You will also see it labelled as either of the aforementioned names. Growing up I knew it as Jamaican Irish moss or simply sea moss so I may use those two names interchangeably throughout this post. Pure sea moss has become contemporary which sees raw sea moss used in Dr Sebi’s alkaline diet, gels/paste and used as a thickening agent. Is Carrageenan the same as sea/Irish moss? No, Carrageenan is a refined and highly processed derivative from the sea moss. This gum extract is what is commercially used in many food and drinks such as ice cream, syrups, beverages and used as a stabiliser or to add texture. This additive has made recent studies connecting it to IBS, bloating, cancer and even inflammation. Many people are under the impression that pure sea moss is not healthy when it’s actually the highly processed substance that comes from Irish moss that is problematic. For this recipe we are working with pure/unrefined sea moss which has not undergone any high processed treatment. The drink itself is minimally processed and not boiled to retain as much nutrients as possible. The traditional method for making Irish moss is non vegan. First of all you would rinse the moss several times to remove any debris and sea salt. Then leave the moss to soak and expand overnight in water so it is easier to boil. From there you would transfer the Irish moss and water into a large pot. Then add thickeners – Isinglass – a substance that comes from the stomach of a surgeon, gum arabic and linseed (flaxseed). All of the aforementioned would be brought to the boil for 30-40 minutes to make a thick gelatinous substance. Next you would allow the liquid to cool slightly then strain off the liquid which would turn completely into a panacotta/blancmange type of gelatin. Once the sea moss gel is portioned, a small amount is added to the blender along with sweetener – condensed milk/honey/milk along with spices and vanilla. Some people turn things up a notch by adding stout, rum, guinness or peanuts for additional flavour. 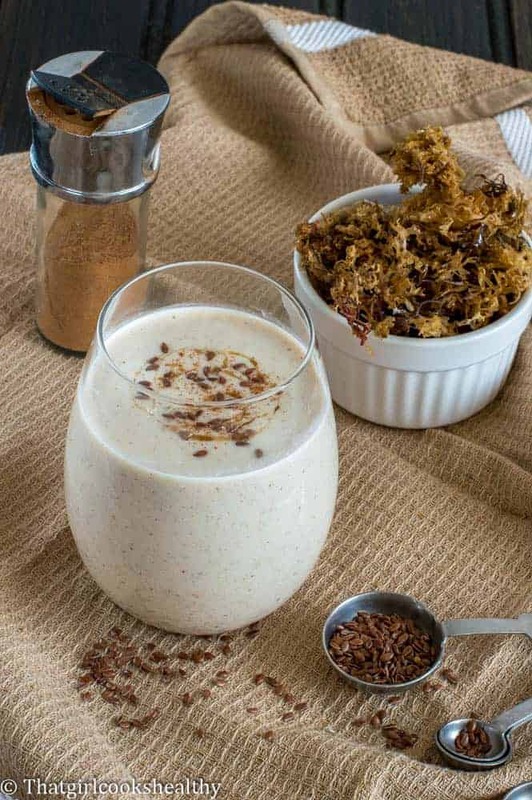 Irish moss is quite a potent drink known as a love potion in the Caribbean so many women would prepare this for their spouse. Nowadays the the drink has evolved so much that it is consumed by both genders. 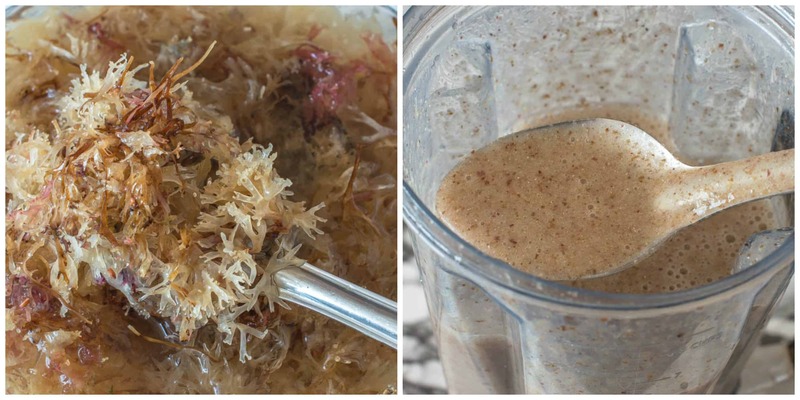 How to make sea moss drink – my way!! 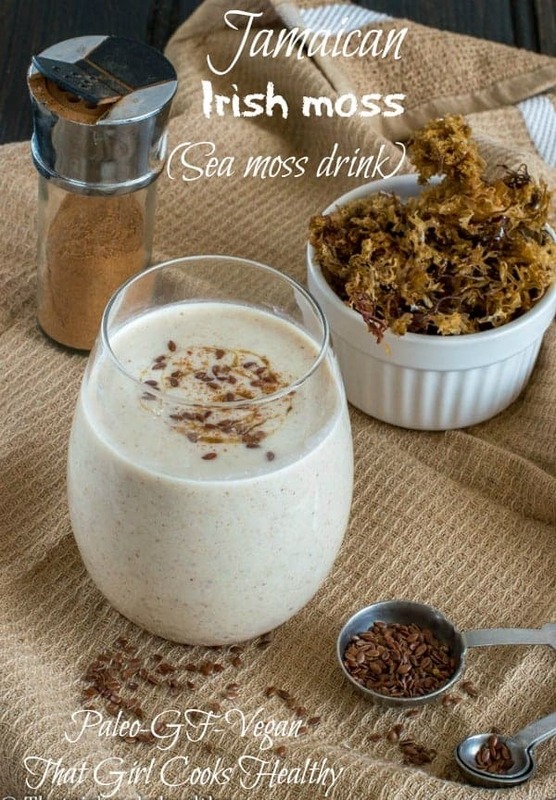 My way of making Irish sea moss drink is different from the traditional method. 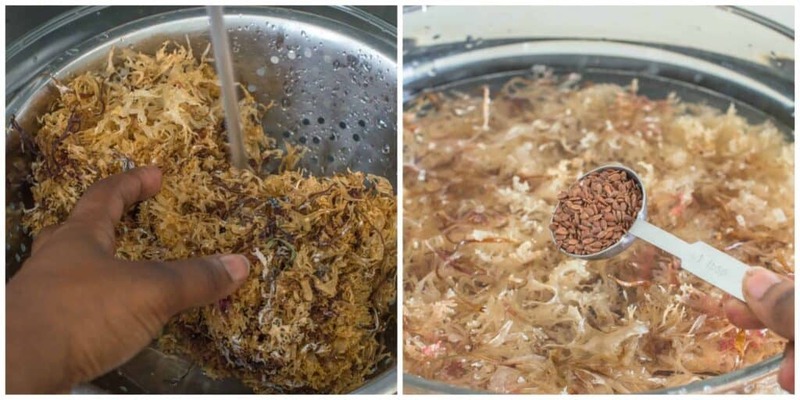 With that being said, I felt it was appropriate to share the true Jamaican way of making Irish moss because whenever I modify a recipe from my heritage I ALWAYS acknowledge it’s origins and reasons for any changes. Don’t boil Irish moss – As Irish moss is packed with so much nutritional value, one of the main recipe modifications is to NOT boil the moss but rather let the moss soak overnight along with the linseed. Although you won’t get that extra thick gelatin, you will preserve most if the nutritional value which is a lot more healthier. Isinglass and arabic gum is optional – As this is a vegan recipe Isinglass is forbidden. Gum arabic is merely a thickener and because we are using the entire sea moss there really is no need to add any additives. Drain off the water from the moss – which brings me to my other point in respect to creating a thick substance without boiling out the nutritional value. Puree the entire moss – The whole sea moss will be used, nothing is to be wasted. Add the moss/flax water to a high speed blender and puree into a gel consistency. Sweetener – I like to use a low GI index sweetener to keep within the realm of good health. Agave nectar, coconut nectar or maple syrup are good vegan alternative to honey. You can also use my condensed coconut milk for additional sweetness. Plant based milk – Coconut milk or almond milk work really well. After making this recipe many times I would highly recommend using almond milk as it really compliments the taste. Store any leftover sea moss gel – Some people suggest storing it in the refrigetor for upto a month. I personally disagree and suggest using the blended sea moss gel in 3-4 days maximum . Alternatively, you can freeze in small portions, ready to use. Irish moss is widely available online (amazon, etsy) and also the best place to purchase it from. If you live in an ethnic neighbourhood then you can find Caribbean brands of Irish moss in your local supermarket. Make sure the moss that you purchase is whole and not flaked. Try to buy sea moss that is described as “wide harvested” or wildcrafted” this a good way of determining its authenticity. Irish moss should also have some signs of debris – sand/sea salt which needs to be thoroughly washed off using your hands. It shouldn’t have a strong smell of cholrine which some people have reported, so be mindful of that. 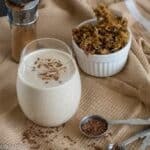 If you want to make a small individual serving of Irish moss drink. 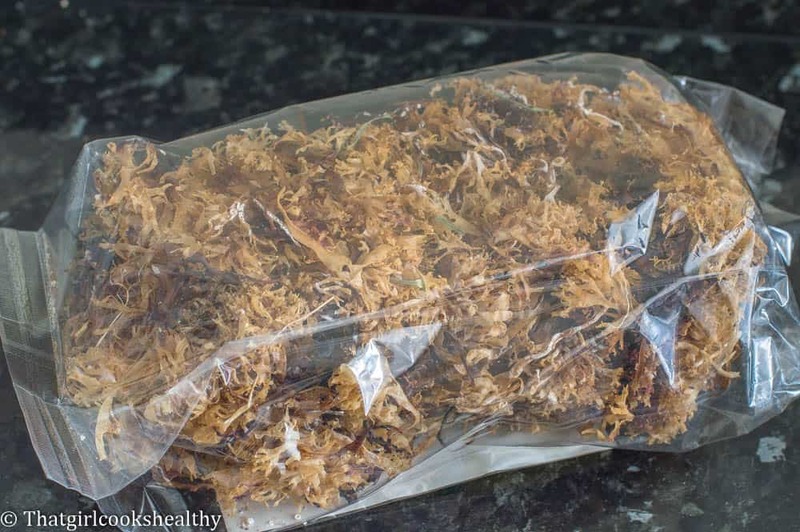 Instead of using the entire bag of moss, simply measure out 1/3 cup of sea moss. Follow the instructions below only using about 2 cups of water soak the moss. As you will using a small handful of moss you skip making the pureed gel and just add the sea moss along with the rest of the ingredients to a blender. 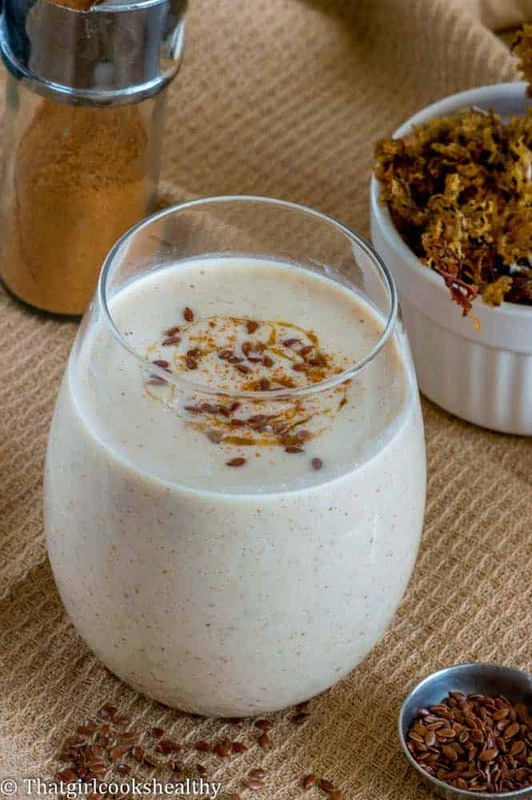 Learn how to make this modified version of Jamaican sea moss drink aka Irish moss drink – vegan style. Place the sea moss in a colander. Use your hands to thoroughly wash any debris and excess sea salt from your moss. Do this several times until the sea moss looks and feels less gritty. Scoop out the paste and transfer into a jar/bowl and refrigerate. Keep the pureed moss in the refrigerator for up to 3 weeks or freeze into small ice cubes. I definitely prefer your way of making this! This is definitely a Jamaican staple! My mom makes it ever so often! I must give this recipe a try! Thanks Shanika. Yup! A try Jamaican drink!! I think because the drink is made from sea moss it’s a bit offputting so I understand why. As you know the Caribbean has an abundance of recipes with an acquired taste. This drink is definitely flavoursome and healthy too!! Wow looks amazing, I make Irish moss all the time but I have never had it with coconut condensed milk. Sounds real creamy like the traditional version. Thanks Michelle! I hope you try it with the vegan condensed milk. I have never heard of this before, but you make this look delicious! I’m definitely game to try it out! How long should you refrigerate the sea moss paste? I don’t find it has a very long shelf life so 4 days maximum. I suggest making it in small batches so nothing goes to waste. I’m not implying that your method is wrong, but simmering the Sea Moss for a few hours does not detract from the potency – it is a true seaweed. In regard to other vegetables and fruit, simmering and/or over-boiling would definitely denature the food making it essentially a poison. On the contrary, I recommend simmering to extract the nutrients, as one would do in the case of roots, barks and stems. Simmer the sea moss on low fire, don’t boil. To add to this, when you simmer the moss with bay leaf, clove, etc., you’re allowing all of those enzymes to collaborate, if you will. Enjoy and thanks for all of your information – Jamaica still has so much to offer that hasn’t been tapped or exploited, thank God Almighty. Hi Blake, thanks for your input!! Highly appreciated. I think the problem with simmering for a number of hours is there’s a risk of carrageenan forming which is really what I’m trying to advise others against doing because it’s linked to inflammation of the bowl. Simmering for a very short period of time would probably lessen the chances this occurring though. Whether you choose to simmer for a short period of time or follow the instructions of the recipe card, the moss will taste equally as nice. Hello… Do you think this drink will be good for digestion issues such as Bile Reflux? Hi Kash. Sea moss itself is great for alleviating acid reflux, try it neat (more potent) or in this drink. It should work, hope I have helped!! I’m a little concerned. My last batch of juice started to solidify into an alge form one night in the refrigerator. Is this normal? Yes. That may happen due to the density. Simply reblend and it should return to its liquid state. Looks great, haven’t had some Irish Moss in a long time. Im going to make this , thanks for sharing. You are very welcome Damion. Hi Charla, I am in the process of soaking 2 oz. of sea moss now. This is my first time. I have read you view on preparing it, but the directions that came with it, says to simmer for 20 mins. I will follow the directions given but will use your preparations for the drink. Should I had the flax seeds while soaking or when it is simmering? Can’t wait to try it. Hi Kookie. Yes add the flax seeds while soaking, no simmering is required. Simply let the moss soak overnight with the flax and blend the next day. I do advise following my instructions in full to yield the same results as pictured. Looks delicious! I’m just starting to discover the benefits of seas moss I just bought some the other day but dried and ground ready for tea? Do I just put in boiled like any tea and drink once cooled? For this recipe can I use the dried sea moss or should it be in it’s raw natural state? Thanks so much! I actually haven’t come across sea moss in its ground form so any information given would be based on pure guess work. In order to obtain the results as pictured I would advise using sea moss in its raw state. In respect to the dried version, I would probably just add some along with the rest of the ingredients to my blender and hopefully you should replicate the results as shown. I hope that’s useful!! Delicious! Did it exactly your way doubled recipe so everyone could try. A little sweet, will try with date sugar next time. Should have made more. Thank you! I’m just so glad you liked it as much as I do. What type of blender do you use? My nutribullet doesnt seem strong enough? I use a vitamix for all my smoothie recipes. I used to own a nutribullet and didn’t find it strong enough for big batches such as this sea moss recipe. Have you tried making the recipe in smaller batches? What seems to be the problem you are facing? maybe I can help. This is my first time trying Sea moss and preparing it also. I’m starting out with 2 oz. of Sea moss so I can store in small batches. I’m taking sea moss for the health benefits only. So could I add it to anything just to get all the minerals I need? Or is the taste so unbearable I have use all your ingredients? And I heard also to add cinnamon to it when simmering is that ok? Yes, adding cinnamon when simmering is fine. Try not to simmer for too long and when simmering do it on low heat so the properties are not depleted. The taste of sea moss is like a tasteless gel, not unbearable but neutral at best. You can add it in anything like smoothies or drinks. Thank you for your wonderful post! Can sea moss be used as a thickener for soups and other foods ? Yes, its quite gelatinous so it serves as a good thickener for most foods. My moss and flax seed are soaking.. Awesome. I hope you like the drink Alexis. Hi. Can you please be more detailed on the single serving proportions? I am soaking 1/3 cup of the moss, but am not quite certain how much of the gel to use after it has soaked, or how much milk, sweetener, etc. to use. Thanks! Hi Cate. I actually made this recipe specifically for bulk batches. However, I can definitely slim line it down to a single serving and update the recipe for you. This recipe is great. I tried it, thank you. Quick question, 1/4 cup of agave for the 1 cup of almond necessary or can I stretch it by adding more almond milk? Thanks in advance. Thanks Anthony, you can easily stretch it by adding more almond milk (maybe 1/4-1/3 cup more) but too much though or the texture will turn too thin.